In the Desert, Silver Reef, Utah, Leeds, Utah, Silver Mines. You;re traveling down the Interstate and you see a sign for an old mining camp or old town in the desert. You go by it a dozen times -- it's probably a tourist trap anyway. Sometimes we even start into one of these sites and then turn around and leave. We've all done this. It's a big mistake, take the time and look the site over. Otherwise every time you go by it you'll wonder if you missed something. Or later on the Internet you'll read something about the site, and wish you hadn't missed that. We've seen the sign at the I - 15 Interstate exchange, Exit 22, and 23 both are exits to Leeds, Utah, which is the jumping off point for the old silver mining town of Silver Reef, Utah. We finally took the time to look it over and do a brief survey to see if we'd like to come back for a more thorough look later on. Yes, we'll go back. There is a lot to see in this area that we missed. Other mining camps, mines, charcoal kilns, mining mills. One on the Virgin River, called the Stormont Mill, looked pretty neat with a lot of ruins. This is an old photo taken in 1971 of the Wells Fargo building in Silver Reef. A short history: The Wells Fargo Express Office was housed in a building which was completed in 1877. It had ornate arches in front with fortress style metal doors. Wells Fargo occupied the north side of the building where they ran the freight and stage coach operations as well as a bank. The south side of the building was home to the Woolley Lund & Judd Mercantile. Eventually, Wells Fargo turned the business over to them and when the mines played out in 1888 the businesses closed. Reduced mining operations continued till 1909. 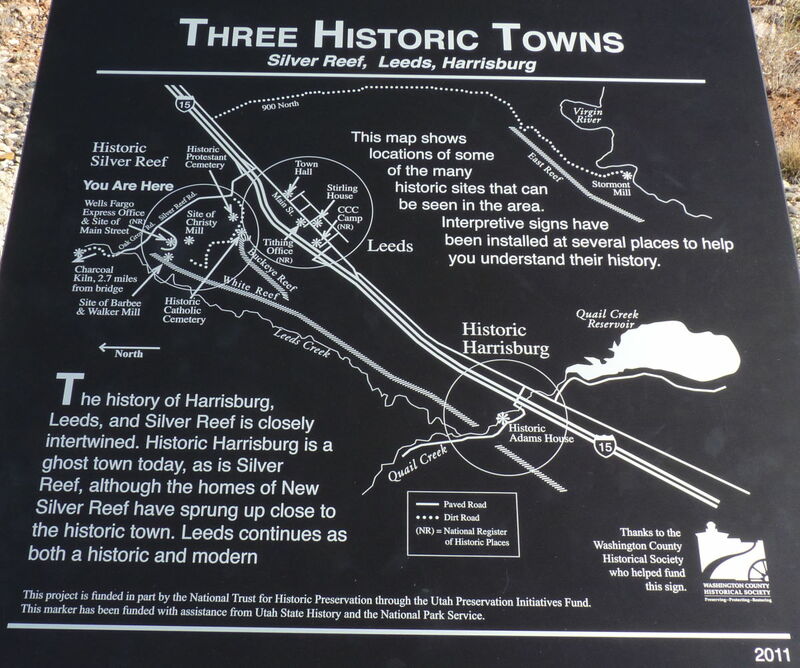 The first sign of silver was found on the southern end of the East Reef near Harrisburg. What's so unusual about this is where the silver was found -- in Sandstone. It is the only place in the US where you can find commercially minable silver in sandstone. Several large pieces of "float" silver were found and this got the whole thing started. It turned out ot be a bonanza with the mines producing approx. 10 million dollars worth of silver in 12 years. Remember, back then silver wasn't worth much. Click on the magnifying glass to enlarge this map. It shows the 3 main mining districts "reefs" that were mined for silver. The Buckeye Reef being the biggest producer. There are quite a few kiosks and information panels at the old Wells Fargo site. This is a Utah Historic site. There is a museum, restaurant, and an old replica of a 1877 stone powder house. These are definitely worth a visit. The ore here was easy to get to as the sandstone was easy to work with, unlike working in quartz veins. St. Johns church. This is odd -- the Catholics and Protestants worked the mines here in the Silver Reef area. Normally in Utah you'd associate any kind of business with the Mormons. This is why this small mining town was so rowdy with bars and brothels? They did end up supplying a lot of money to the LDS church so they could build their temple in St. George. Being located just north of St. George, Utah there is a lot of scenery and unusual plants to found here. Is this a Joshua Tree? One of the many old ruins to found in the town of Silver Reef. There are more old stone walls like this than in any old Ghost Town we've ever visited. I honestly don't know why they lettered this old ore car with "gold". This is not a prominent gold bearing region and is more famous for its silver production. Ingersol-Rand Co. they're name is on machinery in mines all over the west and is something you almost expect to find. A lot of old mining equipment is found in front of the Wells Fargo Museum. There were a couple of these old ore buckets in front the museum. These are kind of unique to this mining district. They did look to be very well built. A little south of the Silver Reef Town site you'll start to see tailing piles, as in the photo below and mine tunnels like the one here that was filled in to prevent entry. Let's take a closer look at the mining area shown here. There are numerous old roads all over this section of land. To the right in this photo above, the light colored rocks are the White Reef.